Bring some mid century flair and kitsch to your walls with this amazing vintage pair of 1950s era abstract musician prints from the one and only House of Ran Su ( or Ransu depending on you talk to). 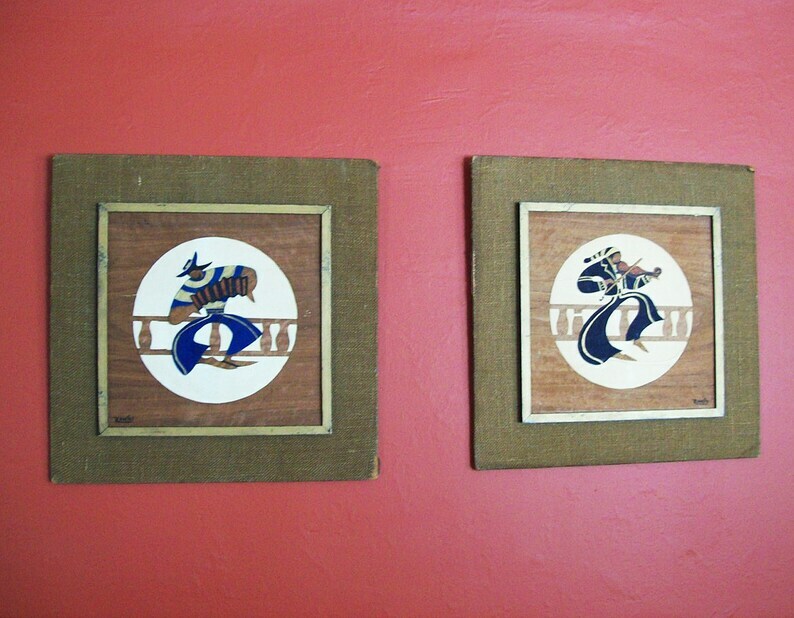 Each wood and burlap print measures just about 18" X 18" and are ready to hang. These prints are in good to decent vintage condition. They both have some water damage, staining and some warping. The burlap on the outer rim of both of the prints is torn on some of the corners and has a bit of other damage. I have tried to show all of this in the photos. I have done a little cursory cleaning but will leave a more complete job to the next owner. They both still look great and all of the damage is reflected in the price! retro paint by number print 1950s 1960s era vintage style kitsch cowboy flamingo clown tropical decor 3.5" X 5"
pin up girl wall print retro vintage Fifties rockabilly kitsch burlesque decor 3.5" X 5"